Mira performed on Show 309, recorded in Vail, CO, on July 9, 2015, at age 17. 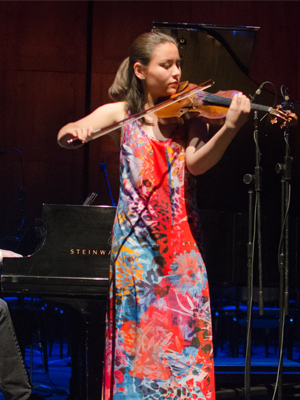 Mira Yamamoto (violin), 17, is from Clinton, Washington, where she began her classical studies at the age of 4. Mira performed her orchestral debut at the age of 9, and has performed with the Saratoga Chamber Orchestra, Eastside Symphony, and Seattle Festival Orchestra, among others. Having been named a winner in the 2012 American Fine Arts Festival, she performed in recital at Carnegie Hall in New York City, and in 2013, Mira was a featured soloist in the NPR series, “Stars of Tomorrow,” recorded at the Heifetz International Music Institute in Staunton, Virginia. She currently serves as concertmaster of the Thalia Symphony Orchestra, a professional orchestra in its 65th season under the baton of Maestro Michael Miropolsky. Outside of music, Mira enjoys art and photography.